American Ecosystems Inc. is dedicated to helping anyone who owns or manages lakes, ponds, ditches or other water retention areas with difficult aquatic management problems. One of the most common situations in the many urban lakes and ponds is the tremendous influx of nutrients from streets, lawns, parking lots and agricultural areas. This nutrient loading accelerates the aging of lakes and ponds in a process known as eutrophication. Eutrophic lakes and ponds lose their natural ability to cleanse themselves. 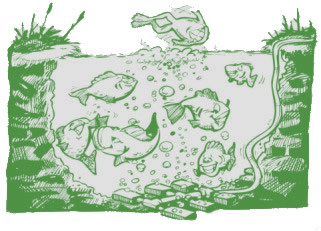 Increased numbers of aquatic plants and aquatic animals resulting from the nutrient enrichment create a high demand for dissolved oxygen, not only when they are alive but also when they die and fall to the bottom to decompose. This creates a self-perpetuating cycle of nutrient enrichment, excess plant and animal growth, oxygen depletion, species elimination, and muck accumulation. 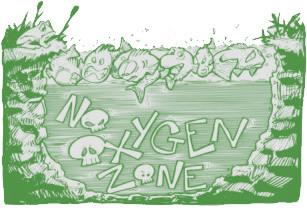 Very often, the rate of oxygen consumption exceeds the rate of absorption and fish and animal kills occur. Most lakes and ponds in Florida exhibit a phenomenon known as stratification during a significant portion of the year. Stratification is caused generally by temperature differences between the surface water that is constantly heated by the sun and the deeper levels where there is colder denser water. Warm water floats over the cooler water. These layers seldom mix and this phenomenon causes several problems for the well-being of the lake or pond. Oxygen is gradually depleted in the lower layers, and because the natural diffusion rate for oxygen entering the lake or pond from the surface is so slow, it is easily consumed before reaching the bottom. Without oxygen, the only organisms that can live are anaerobic and facultative bacteria. All other animals that rely on the water for their source of oxygen will be eliminated. This includes worms, mussels, fish eggs, and crawfish. Fish may survive by migrating closer and closer to the surface. The anaerobic bacteria now populating the lower layers of water produce toxic hydrogen sulfide (rotten egg smell), carbon dioxide, ammonia, and acids. The most efficient and cost-effective way to reverse this degradation is to eliminate the stratification of the lake or pond through the use of an aeration system that creates an upward current of water that will transport the oxygen-poor bottom water to the surface for exposure to the atmosphere. A simple method of inducing an upward current is to take advantage of the natural lift capability of air bubbles rising upward through water. Much research has been conducted on the use of the unconfined (no pipes or tubes) air lift for use in lake and pond aeration/destratification. Underwater flow tests using dyes and streamers were used to determine the best diffuser shape as well as size and configuration of the bubbles. Other parameters, such as how many diffusers to use in a lake and where to locate them on the bottom and the compressed air requirements for each system, were determined by oxygen, temperature, and conductivity monitoring throughout the water column. These tests were conducted in severely stratified impoundments in both fresh and salt water. Our air lift diffusers will lift more bottom water per unit of air and electricity than any other device applicable to lake or pond destratification. An extremely efficient compressor inside a soundproofed lockable metal container is mounted on the shoreline on a concrete block. Each diffuser is supplied with air by 1/2″ underwater tubing anchored to the bottom with bricks. The diffuser releases very small bubbles from a 4-foot square area. The spatial arrangement of the diffuser is such that the water immediately around it can enter and replace the water that has already moved up. This allows for a minimum of turbulence (tumbling motion without flow) within the first 6 feet above the diffuser. The rigid fiberglass panel underneath the diffuser also protects against erosion and turbidity. The expanding and rising bubbles then spread away from each other to a maximum of approximately 10 square feet. The column of water contained within the stream of bubbles rises at a rate of one foot per second and moves 2,000 gallons per minute from the vicinity of the diffuser and approximately 4,000 gallons per minute near the surface. The circulation and destratificaton which result is easily understood. The benefits that are derived from the path of the water as it rises and spreads out at the surface are not as readily apparent. It is at the surface where the real efficiency of the system is developed. The “boil” at the surface is created by the kinetic energy of the upwelling water and rises 2 inches above the water’s surface. When the water leaves this mounded up area, it spreads out across the surface until its energy is dissipated. From this area (approx. 4,000 sq feet) around each “boil”, toxic gases from the bottom layers of water can escape. Oxygen can then be reabsorbed up to its saturation point. As the new oxygen-rich water spreads out and away from the boil, its density now is greater than that of the surrounding water. It then drops downward to eventually be lifted again. Eventually the entire water body is aerated and destratified and it can now begin to realize the benefits of a lake or pond with its purification abilities restored. Toxic gases from the bottom are vented to the atmosphere. Danger of fish kills due to oxygen depletion is virtually eliminated. lncrease in the numbers and size of fish. Improved water clarity as dominant plant species shifts from algaes to rooted plants. Shift in metabolism of lake from hard-to-control blue-green algaes to more readily controlled green algaes. By keeping the bottom aerobic, the rate of decomposition of fish and animal feces and detritus will be accelerated. An aerobic bottom can also reduce the rate of sedimentation by allowing oxygen-breathing bottom-dwelling organisms to consume organic sediments. Low cost to purchase and to maintain. Monthly usage of electrical power is minimal. Higher oxygen transfer efficiencies per unit than any other type lake or pond aeration. Efficiencies of 11 Ibs of oxygen per kilowatt hour are possible. Depending on several variables, as little as a 3/4 horsepower compressor may be needed to aerate a 15 acre lake. Mixing of water is from bottom to the top with no erosion and no increase in turbidity. Can be installed from a small boat. No danger to boaters, swimmers, skiers, and aquatic life. No marker buoys are necessary. Ceramic diffusers are glass bonded to give many years of trouble-free service. Systerns installed up to 20 years ago are still going strong. We provide professional installation and technical assistance. Call us for a free proposal for the safe and efficient aeration of your lake or pond. We are confident that you will be satisfied with the quality of our service. American Ecosystems covers the entire state of Florida and has Offices in Largo, Sarasota, Odessa, and Orlando, Florida. American Ecosystems, Inc. Copyright © 2013. All Rights Reserved.